As you can imagine, truck accidents can produce serious injuries and fatalities to anyone involved. Although it’s easy to point blame to the person driving the largest vehicle, to prove this is not always an easy task. Especially once the trucking company with its large team of lawyers gets involved. 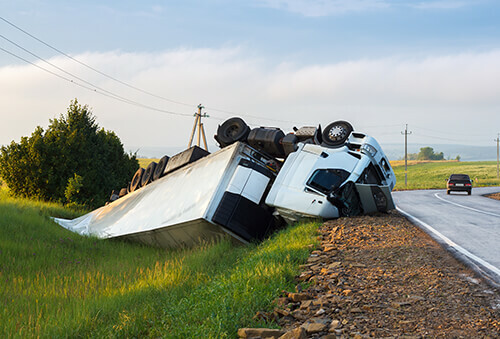 After you or a loved one gets into a truck accident, a thorough investigation is much needed in order to find out what exactly happened and who is really to blame. This is why it’s essential to hire a truck accident lawyer with the experience and the resources needed for these types of cases. A lawyer will be able to hire the necessary experts to support your claim. For instance, if there was an issue with way the highway was laid out that caused your accident, an experienced lawyer will know to hire someone who can say just what was the problem with the layout to cause your accident. Take photos. Chances are after getting into a truck accident, you’re going to need medical assistance and won’t have a chance to take photos at the accident scene. But that doesn’t mean you shouldn’t take photos of your own injuries. In fact, these photos can be crucial and used to show the extent of pain and suffering you experienced as the result of this accident. Record everything. Make sure you keep a detailed record of everything that happens after the accident. Try to write down as much as you remember of the accident. Then, make sure you take notes of all your medical appointments and any expenses relating to the accident. Contact info is key. Did you have a passenger during the time of the accident? Were you able to talk to witnesses at the accident scene? Make sure you get the contact information on those valuable witnesses! It’s also important to get the police report, which many have that contact information you’re looking for. And remember, the most important piece to this puzzle is to contact the experienced truck accident lawyers a de Lachica Law Firm, PLLC. We will make sure you are properly compensated for your injuries. Call now for a free consultation. Can Someone Else Be Responsible for my Single Vehicle Accident?